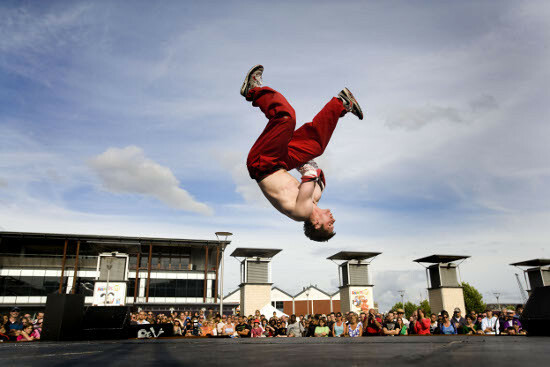 Held on a late summer weekend, Bristol Harbour Festival is the best place in the UK to catch a high concentration of outdoor circus – the festival's Circus Stage programmes a long afternoon of back-to-back performances broken only by the necessities of rigging. Recently the Circus Stage has moved to Castle Park, where a depression in the grounds forms a sort of natural amphitheatre – a perfect rake, and large enough to accommodate its audience where elsewhere the festival (which takes over several of Bristol's iconic spaces) is struggling with the scale of its own success – impromptu one-way systems and dense, massive, shuffling crowds make it hard to move from one area to another. The circus programming is light and summery, quick and easy – but benefits from Bristol's extremely high density of circus performers: it's a particularly good place to see technical aerial acts.